What is Acromioclavicular Joint Arthritis? The acromioclavicular joint also is known as AC joint is located at the top of the shoulder. Arthritis in this area is known as acromioclavicular joint arthritis and is typically indicated by experiencing pain, tenderness, soreness, and reduced range of motion in the shoulder(s). This type of arthritis can take many forms. For instance, it may start off as osteoarthritis and take on more inflammatory features turning into rheumatoid arthritis. The condition may be contributed to genetics or may trigger as a result of an injury. The same may also occur because of multiple mini-traumas of the shoulder joints. In any case, the AC joint degeneration if left untreated will lead to abnormal joint function, inflexibility, and pain. Localized pain and tenderness that peaks and subsides at the top front of the shoulder. The discomfort may also be accompanied by a low level and persistent pain underlined by flare-ups of more severe pain. Pain experienced while performing certain activities like reaching arms out across or behind the back. The same may also happen when trying to lift an item from an overhead cabinet. Joint stiffness happens due to damage to the synovial fluid or a tear in the articular cartilage. This problem can cause reduced flexibility in the joint. Weakness experienced in the shoulder results from a compromised strength of the shoulder muscles. It can cause impaired shoulder function and reduced movement. 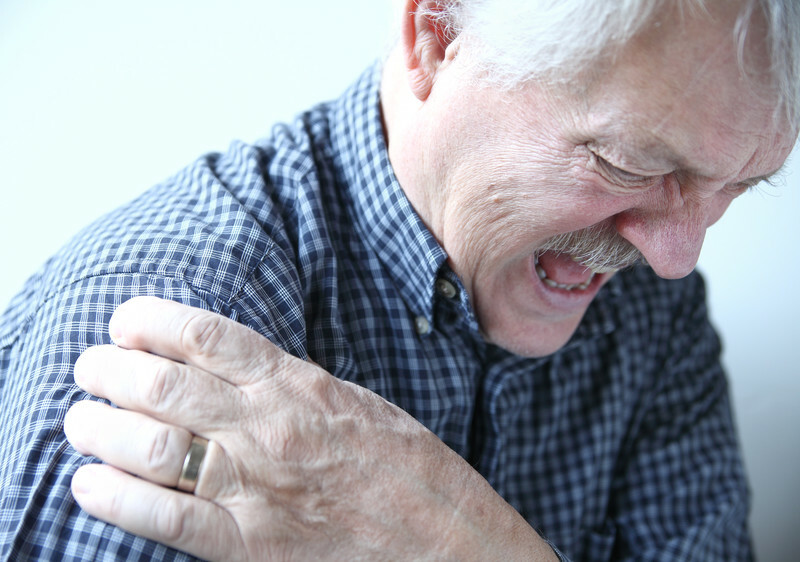 Wear and tear of the shoulder joint can trigger AC joint arthritis. There is a loss of cartilage over time and the joint wears out. Surgery or serious injury to the area can trigger AC joint arthritis. In many cases, the symptoms do not appear for a long time ranging from a few months to a few years. Individuals spending a lot of time lifting objects overhead are more prone to developing this condition. This can also include otherwise super fit individuals such as weightlifters, rugby players and other taking part in high impact sports. AC joint arthritis treatment options include using warm or cold compresses to loosen stiff joints, activity modification to reduce the pain and some kind of physical therapy. Many patients with AC joint injury can start to feel better with physiotherapy. Even though the process is usually a long-term treatment, patients report experiencing relief soon after treatment starts. For complete ligament healing, however, physiotherapy will need to be administered for a minimum of six weeks. The aim of the therapy is to reduce pain and inflammation, normalize the range of motion and strengthen the shoulder. Others suffering from AC joint arthritis may experience temporary relief from discomfort as the condition is a progressive one and cannot be reversed. In more severe cases, patients may choose to undergo AC joint surgery followed by rehabilitation with physiotherapy.